Toronto, ON., (January 29, 2015) — Lexus International today announced the finalists for the third Lexus Design Award, an international competition established with the aim of supporting young up-and-coming creators. 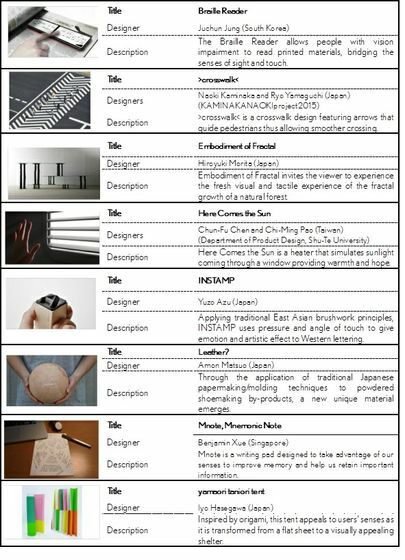 A total of 1,171 entries from 72 countries on the theme of “Senses” were judged by a panel of world-renowned designers and creators in November in Tokyo. 12 finalists were selected. 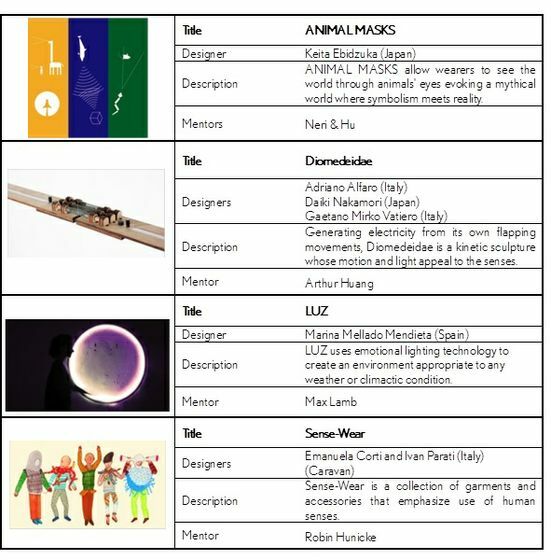 Four of the 12 finalists will get the chance to produce prototypes of their winning designs with assistance from world-famous engineer and architect Arthur Huang, game designer Robin Hunicke, architects and designers Neri & Hu, and designer Max Lamb. The resulting four prototypes will be exhibited at this year's Milan Design Week* in April along with panel presentations of the other eight finalist designs. All 12 finalists will have the opportunity to present their ideas at the Lexus exhibition booth from April 13 (press day and award ceremony) to 19. The Lexus Design Award Grand Prix winner will also be selected from among the four prototype finalists during Milan Design Week. The finalist entries and judging committee comments can be viewed at LexusDesignAward.com. Those attending Milan Design Week are welcome to visit the Lexus booth at T32 Torneria/Carrozzeria, Via Tortona 32, 20144 (Zona Tortona). Further details regarding the Lexus booth will be announced mid-February. This year's Lexus Design Award drew a large number of submissions, and a wide variety of wonderfully original ideas. In keeping with the theme of "Senses," many submissions appealed to the five senses or emotional, rather than physical, aspects of the human experience. After extensive discussion the 12 finalist entries were selected for their potential contribution to design innovation. The Lexus Design Award competition is an international design competition launched in 2013 to foster the growth of ideas that contribute to society and to support up-and-coming creators whose work can contribute to shaping a better future. * The world's largest design exhibition and features numerous events presented by furniture and fashion brands seeking to present their unique vision to the world.